Tired of your bedroom? Think your living room has lost its life? Wishing you could do some room makeovers but just don't have the budget? It's time to think of area rugs. You may think an area rug is just an accessory. However, an area rug can be the focal point for a room - in fact changing the whole look and feel of the room. Area rugs may be the most versatile flooring product available. They define a space and add a colorful finishing touch. Area rugs can be installed on top of any other type of flooring: hardwood, luxury vinyl, stone tile, even wall-to-wall carpet. Add an area rug and you've got a quick and easy room makeover! Ready to add an area rug? Consider these tips when looking for just the right centerpiece for your room makeover. Then stop by Indianapolis carpet store, Kermans, and ask our design experts to help you find the best rug for your home, lifestyle and budget. Consider the traffic the rug will see and get the fibers that will hold up the longest. Get the right size area rug for your space - a surprising number of people choose one that's too small. Read our article on size and placement of area rugs. Look for a rug that fits your design style - bold colors, new patterns, thick textures... they are all options and ways to really make a big impact with a relatively small piece. Think outside the box. Area rugs come in all shapes and sizes. At Kermans we can even make you a custom area rug for the perfect fit. Don't stop with just one. Layer your area rugs for a more interesting look. 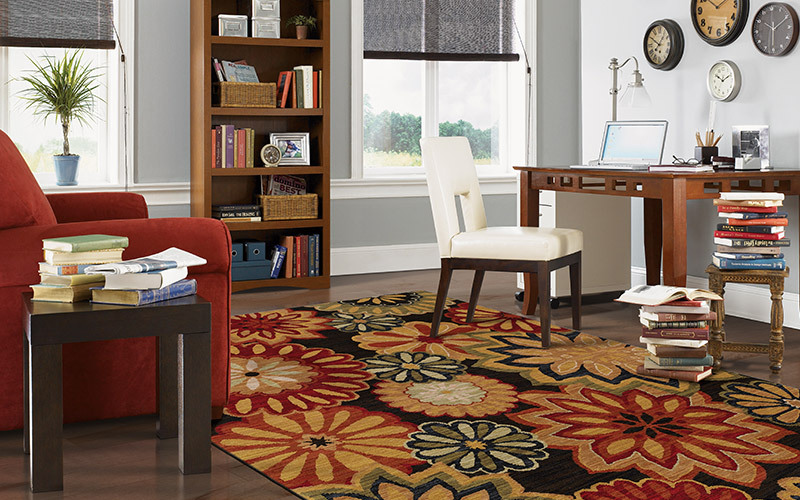 Or consider adding two rugs in a large space to make the room look and feel very different.